Appointments can be made by telephone, on-line via the link at the top of this page or pop along to the surgery during opening hours. In order to use the online system you will need a user name and password. To obtain this you will need to take some form of official identification (e.g. your passport) to the surgery – this is for security reasons. Please contact the surgery for further information. You may consult with any of the doctors. The majority of appointments are bookable up to six weeks in advance. Urgent appointments (i.e. 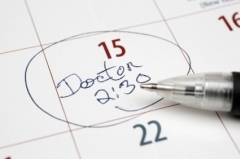 appointments that cannot wait until a routine appointment is available) will be seen the same day from 11:20. On these occasions it will not be possible to accommodate your choice of doctor. Please, do not abuse this service. If you would like a chaperone present during your consultation, please advise the receptionist when booking your appointment or you can inform the GP or nurse before the consultation commences and they will arrange for a chaperone to be present. If you cannot attend an appointment for any reason please inform us as soon as possible in order for us to give the slot to someone else. Every month in excess of 100 patients fail to attend their appointments.